Percy is jet black with green/gold eyes. 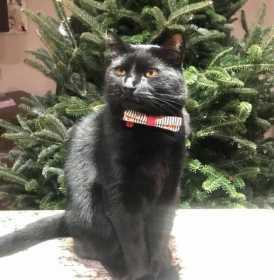 Last seen wearing red bow tie with hearts at 1308 Kenilworth Avenue in the Dilworth neighborhood of Charlotte, NC. He has pink caps on his front nails. Friendly but may be injured.